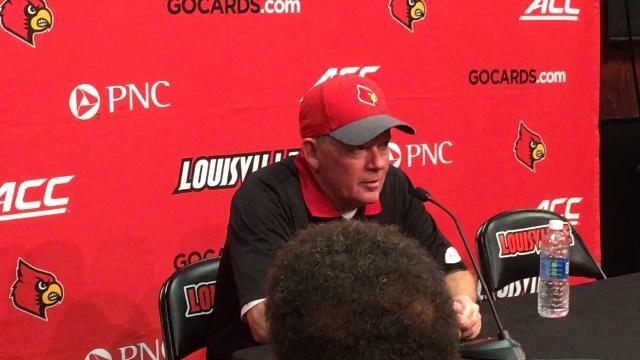 The Louisville football team turned in its worst performance of the season Saturday against Boston College, losing a 45-42 debacle at Papa John’s Cardinal Stadium. 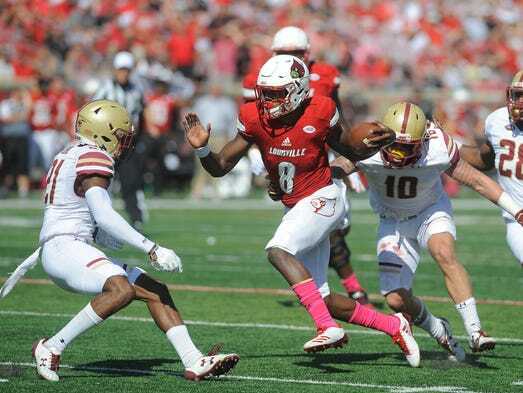 The defense ruined Louisville’s chances again: Peter Sirmon’s unit had few answers for a Boston College offense that entered Saturday ranked 115th in the country with 322.5 total yards per game and 120th in the country with 16.3 points per game. The Eagles on Saturday racked up 555 total yards and 45 points. Running back AJ Dillon pounded Louisville’s defense for 39 carries, 272 yards and four touchdowns. The Cards injured Boston College quarterback Anthony Brown in the third quarter — but backup Darius Wade came in and led a 14-play, 72-yard drive over 5:19 to tie the score. He finished 7-for-10 for 91 yards. Louisville’s defense is in shambles right now. Lamar Jackson’s interception didn’t help: The Heisman Trophy winner has now worsened Louisville’s deficit by throwing a costly interception in every loss this season. Saturday’s was the first that wasn’t returned for a touchdown, but still, near the end of the third quarter Jackson threw the ball right to Boston College defensive end Wyatt Ray, who returned it to the Louisville 22-yard line. Boston College scored four plays later. Jackson completed 19 of 39 passes for 332 yards, two touchdowns and an interception on Saturday. He also carried 22 times for 180 yards and three touchdowns, breaking the school rushing yards and touchdowns records. He was not Louisville’s problem. But when the Cards sought a rally in the fourth quarter, Jackson again didn’t have enough heroics. Jaylen Smith’s presence is a big boost for Louisville: The Cards’ best receiver returned from a wrist injury Saturday, one of few bright spots. Smith immediately made his presence felt on the first drive, with a 34-yard reception that would have been a 55-yard touchdown if not for a holding penalty behind the play. Overall, Smith finished with six catches for 118 yards. He also seemed to aid wide receiver Dez Fitzpatrick on the opposite side, who continued a terrific season and caught a 40-yard touchdown from Jackson in the fourth quarter. Of course, Smith also committed the fumble that gave Boston College the ball back for the game-winning score. Louisville is trying everyone it can use on defense: On one drive in the second half, the defense started with normal starters Zykiesis Cannon and Trumaine Washington on the sideline, and TreSean Smith and Russ Yeast in their places. Boston College gashed that secondary. Then, the Cardinals reinserted Cannon and Washington — and the Eagles rolled down the field again. Louisville’s defensive backfield is healthy again with Alexander back, so injuries are no longer an excuse, nor are substitutions. The Cardinals just don’t have any answers right now. The final statistics could have been worse, too. In a 42-35 game, Louisville let wide receiver Kobay White loose in the secondary, but Wade missed what would have been a touchdown.